Happy Birthday To Me & Our New Home. Are you ready to see what I got for my birthday? Saltwater pool off family room in back of house. We made an offer on this home and it was accepted yesterday on my birthday! saved us lots of money and no more salmon color! Congratulations, Sherry and Happy Birthday!! All the very best in health and happiness in your new home, now and always! What a FABULOUS birthday gift for you! Enjoy!!! PS: Can't wait to see more pics!! Happy Birthday and congrats on the home! Congratulations, Sherry! It sounds like it's going to be perfect for you and your family. Can't wait to see more of it! HAPPY BIRTHDAY and CONGRATULATIONS!!!!!!!!!!!!!!!! The house sounds great, the pool is gorgeous and SO glad they were painting:) How wonderful to have the guest house too!!! We finally had settlement on our old house on Friday!!! YIPPEE!!!!!! Sherry, congratulations on your beautiful new home and Happy Birthday! That is one great set up!!! Can I ask where about are you in Florida? I need a home like this for my aging MIL. We are getting tired of our frigid winters. Congratulations ! It looks beautiful ! Happy Birthday ! Happy birthday and I am so thrilled for you!! Happy Birthday indeed…congratulations and I hope the inspection went off without a hitch! Sherry your new home looks gorgeous!! Congratulations…what a super gift! Can't wait to see more pictures. Congratulations!!! I can't wait for more pictures!! How wonderful to have your dad with you and for him to still have some independence. HAPPY BIRTHDAY Sherry!!! WOW…what an awesome birthday gift! Congrats on the house, I know that you must be so very excited to get it. I will say, I didn't see you keeping that color…lucky that they went with a good color. HAPPY BIRTHDAY!!! CONGRATS on the new home. Happy Birthday Sherry…I'm so happy for you!! Can't wait to see more photos! Happy Birthday!!! May all your wishes come true 🙂 This is an awesome birthday present!!! Happy Birthday Sherry and what a great present. The home looks beautiful. Congrats. Great birthday present. Can't wait to see more. Happy Belated Birthday. Congratulations and Happy Birthday, Sherry! Happy Birthday and congrats on your new home-looks delightful! You will enjoy the pool so very much-living in Texas we have one and I will tell you, it makes these hot Summers very pleasant! gorgeous sunset, and happy birthday. looking forward to seeing more of your new home on the blog. So happy for you Sherry! What a birthday to remember! Have a great and happy one dear! Congrat's to you on your new home. I can't wait to see more; we bought a new home in Dec. but won't get to move into it until May or June. It is so fun and I can't wait; I've been packing already, so most of our house is done! Have fun as your move draws near. Congrats on buying your next home! It looks like it will be so nice for you and your family. I love the pool and the guest house you mentioned. Happy Birthday and congratulations on the new home! It looks fabulous and will be even more wonderful when you bring your style to it. The set up is great for you and your dad. How wonderful! We just finished building a cottage behind our new house for my mom. We tried very hard to find a house that already had one, but couldn't. Congratulations! and a very happy Birthday to you! Happy Birthday! Wow, what a great present. Can't wait to see more of your beautiful new home. Oh Sherry…This is soooooo exciting. It was obviously meant to be and now everyone will have there space!! Wow Sherry, this is great news! Happy Birthday and I'm so happy for you. What a birthday gift! I'm sure it was a fabulous day! Sherry, congratulations and happy birthday! Happy Birthday and a big congratulations on your new home. You will love your salt water pool. It is wonderful when you find the right home and on your special day. It was meant to be. Happy birthday. And I'm happy that your dad will have the guesthouse great setup. Will be living vicariously as you make the house a beautiful home. What a wonderful birthday present, Sherry! Happy Birthday! Hope everything goes off without a hitch! Happy Birthday and congrats!! 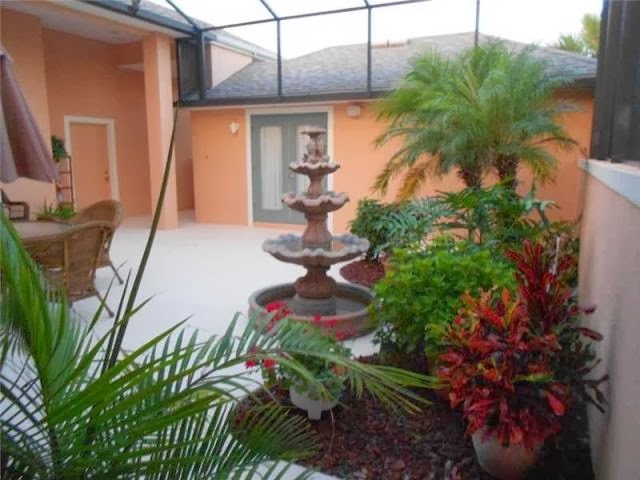 !…Our last home in Florida was a "U" shaped house that wrapped around the house too…had a little "guest room" that was separated from the house that my hubby used as an office…sounds so much like ours!….Cannot wait to see more and what a beautiful view! Congratulations and Happy Birthday! I have always thought a U-shaped house would be perfect with the pool in the center. Love the rear yard. Very nice! That's quite a birthday present! Happy Birthday! We recently went house hunting in Florida to start to figure out what area we may want move to eventually. Enjoy your new home! Oh Sherry – congratulations – how wonderful !!! Can't wait to see more pics – but that pool is spectacular! Congratulations!! So excited for you Sherry! And Happy Birthday!! What a great gift! How absolutely fabulous Sherry, congratulations, I am soooo Jealous :). I can't wait to see what you do with the courtyard, you have so many options there, it will look stunning I am sure. Happy Birthday and Congratulations on your new home. So nice your Dad having his own little place right there with you. Cheers for the new house that so nicely has a wonderful little home for your father and all of that screened-in outdoor space, pool and all!! Happy Birthday to you, indeed, although it's belated as I write this. I look forward to more photos, of course. Don't you miss being in Virginia where Monday's 4" of snow lingers in the shady areas and we may have freezing rain tonight and tomorrow? No?! Happy Birthday and Congratulations on your new home! Happy Birthday and a big yee-haw on your new home! 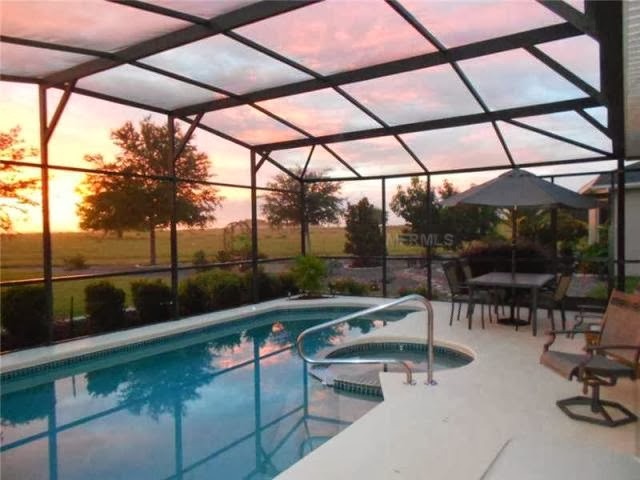 That swimming pool area … what a fabulous place to watch the sunset or sunrise, whichever is the case. All the best and can't wait to see more. Happy Birthday indeed! Wow, what a BEAUTIFUL pool. Can I come swimming? =) You are going to have so much fun decorating. Congratulations Sherry and hope you have a beautiful, happy birthday! Congratulations on your new home, it looks beautiful! And hey, we are almost birthday buddies- I'm March 3! Congratulations and Happy Birthday! Gorgeous home! Now that's a birthday present! Happy Birthday Sherry, I am so thrilled that you finally found a house you love and how perfect that it has a guest house for your Dad! Can't wait to see more! Sherry! How very, very, very exciting!!! It sounds like a great set-up for your daddy too. Happy Belated Birthday! I am so thrilled for you.